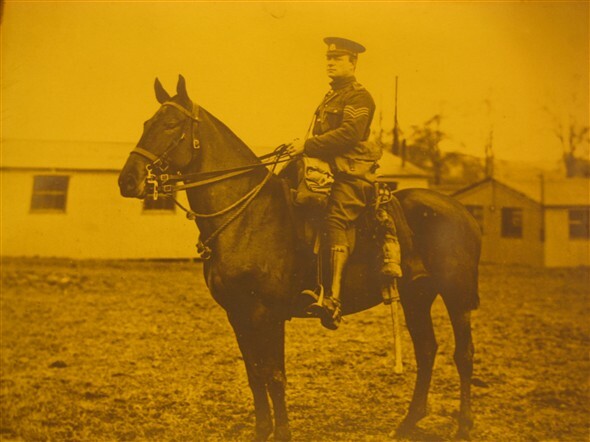 4469 Sgt Harry Coverdale, Royal Military Mounted Police on mare 'Vidy' attached to 16th Lancers in the Field, before going to the Somme in France where he won the military Medal for saving a wounded officer on the battlefield of the Somme. Kind regards, Lee (Coverdale) Harker. I am responding on behalf of Charlie Coverdale. His dad, Harry, was born in Southend in 1888. In 1910 he lived in Brighton and worked in the licencing trade. Hi Lee and Charlie, not sure if I am related to the same Coverdale but my great grandfather was Harry Coverdale of Brighton, England. He was a sgt and I saw pics of him on horseback many years ago in family albums. He was in the Boer War as a young man and WWI later on. I know he was born in London and moved the family to the Brighton coast. He ran a jewelry shop. My mother (Shirley) was his grand daughter. My grand mother was Rene (Irene), sister of Nora, Hetty, Johnny, Pat and Harry Jr.. My mother emigrated to Canada in 1957 and, well, here I am. Does any of this put us in the same family or are there 2 Harry Coverdale's with 2 very similar backgrounds? Message for Phil Steinberg I am writing this on behalf of Charles Patrick Coverdale He is my Brother in Law all the names as mentioned in your E-mail are his sisters and brothers. His full name is Charles Patrick but was know by the family as Pat. Shirley your mother is his neice. He would like to hear more from you and would be interested to tell you more info on the family if you wish. I too am descended from John Coverdale, Julia Speak etc. Please contact me if you wish. Hello Ian, Great to hear from you. I know you are a relative, and I know your related through Annie (Coverdale) Sorell..?..my great aunts daughter, who married into the Broinowski family..I have read about your very interesting family...marvellous..!..at long last I am finding relatives.. Kind regards, Lee..